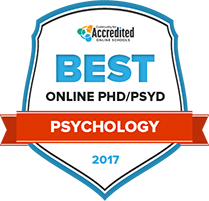 What are the Best Online PhD in Psychology Programs of 2018? Professionals seeking to advance their careers in the psychology field may be looking to do it through an online PhD program. Online programs often allow for a higher level of flexibility than traditional programs do; students can often continue to work, tend to familial obligations and study from home. Find programs, see what a typical timeline for a doctoral degree in psychology looks like, and discover more about possible career options below. The flexibility of online PhD psychology programs typically allows students to continue to work in the field and maintain family commitments while obtaining an advanced degree. Students may be overwhelmed when looking for a well-suited PhD in psychology program because there are so many. The rankings list below considers factors like student support services, graduate tuition and fees, job placement rates and peer-based value to help prospective students narrow down potential programs. Since 1959, the PhD in clinical psychology from the Loyola University Chicago has been fully accredited by the American Psychological Association—the leading professional organization in the United States that represents the field of psychology. The goal of the PhD program is to provide its student with a strong education in the practice and theory of clinical psychology as well as in general psychology. The course takes four to five years of studies with a minimum of 72-hours of coursework. GRE test scores are required with application. Applicants are narrowed down and invited to interview, and only 35 students are admitted to the program. The department of psychology at the University at Buffalo offers several PhD programs. Doctoral students may choose to enroll in the behavioral neuroscience program, the cognitive psychology program, the clinical psychology program or the social-personality program. The doctoral degree psychology program is research-based. Admitted applicants typically score within the 81st percentile on the GRE verbal and the 68th percentile on the GRE quantitative. Students do not need an undergraduate degree or graduate degree in psychology to be accepted to the program. PhD students may pursue the teaching assistantship opportunities offered at the University at Buffalo. Fordham University was established as a Catholic, Jesuit institution in 1841. Currently, it serves 6,431 graduate students. Fordham’s graduate programs in psychology are only open to full-time students. The Clinical Psychology Doctoral Program (CPDP) is based on the Boulder Scientist-Practitioner training model emphasizing theories and practice of assessment and diagnosis with a strong laboratory component. During the first two years, doctoral students must complete courses in cognitive assessment, personality assessment, psychopathology, and clinical diagnosis. Supervised practicum experiences are taken in the second, third and fourth years. Specializations include: Child and Family, Forensic, Neuropsychology, and Health. Since 1949, the clinical psychology program at the University of Tennessee Knoxville has been accredited by the Committee on Accreditation of the American Psychological Association. The program is based on the Tennessee Model, which regards practice and research as similar enterprises, and trains highly competent students to become clinical psychologists and contribute to their field as teachers, clinicians, and researchers. Students receive a balanced education in research, psychological assessment, psychotherapy, and teaching, and are provided internship opportunities in addition to innovative curriculum. Admission is based on a rigorous selection process, after which between seven and nine students are chosen. In 1888, Temple College was founded in Philadelphia. Today, Temple University has grown to include 17 schools and colleges in eight locations, serving more than 38,000 students. Of those, more than 100 graduate students are enrolled in graduate psychology degree programs. The Clinical Psychology Program prepares doctoral students for careers in research, education, and scientific clinical professions. Some 60-70 PhD program applicants are invited to campus admissions interviews each January. Applicants are encouraged to take the GRE Advanced Test. The PhD program is accredited by the American Psychological Association (APA) and the Psychological Clinical Science Accreditation System (PCSAS). Students attending the psychology program at Texas A&M University may choose between six areas of concentration, including behavioral and cellular neuroscience, clinical psychology, cognition and cognitive neuroscience, developmental psychology, industrial/organizational psychology, and social and personality psychology. TAMU combines the science and practice of psychology to help students learn, research, apply knowledge, solve problems, and promote healthy human development. The school admits approximately 100 students into the psychology PhD program, and a low student-teacher ratio is maintained so students can receive personalized counsel and develop professional and research skills. The doctoral program for psychology offered at Boston University may be worth considering for any graduate student who wishes to further their education. Students from over 130 countries have travelled to study in one of the 250 fields offered at Boston University. The students at BU run more than 450 clubs and organizations, allowing for a rich educational community. Students who wish to expand their cultural understanding may be interested in applying for one of BU’s numerous study abroad programs, which are spread throughout 26 different countries. On average, qualifying students are awarded almost $30,000 in financial aid. Baylor University was chartered in 1845 in Waco, Texas as a private Christian university. Today’s 2,611 graduate/professional students pursue master’s and doctoral degrees in more than 115 major fields. The 78-hour PhD psychology degree program requires completion of 37 core courses, and specialty concentrations in behavioral neuroscience, social psychology, and general experimental psychology. Students must declare and pursue a minor, or may substitute nine hours of elective courses. Program applicants are required to hold a bachelor degree and a minimum GRE total score of 300. Applications are due the second week of January. What sets Pennsylvania State University’s psychology department apart from other universities are its veritable choices of doctorate degrees in psychology. Prospective students have the option of pursuing graduate studies in social, developmental, cognitive, industrial-organizational, and clinical (adult and child) psychology. Students should note that having an undergraduate psychology degree, without an MS degree, can still qualify them for a place in the PhD program. Students without a master’s degree can choose to earn one adjacent to the PhD in this program. This is a full-time program, so this degree is not for working students. Loma Linda University, a Seventh-day Adventist educational institution focused on health sciences, admitted its first nursing students in 1905 in California. Today’s university campus includes the school as well as the Loma Linda University Medical Center. The PhD in Clinical Psychology degree program takes six years to complete, including a required internship. Based on the scientist-practitioner model, the doctoral curriculum combines research and practice. The practicum is designed to provide supervised internships across a range of practice areas in multidisciplinary settings. Students can choose from optional concentration areas in clinical child psychology, health psychology, and neuropsychology. With the growing number of online programs, psychology students may have a hard time narrowing their search. This online search tool can aid in the hunt to find accurate, unbiased information. Prospective students can search according to filters, such as state, degree level, subject, accreditation, cost, student population, and public or private school type. Pursuing a doctoral degree in psychology online is often a big undertaking. Prospective students should take this venture seriously as this advanced degree is often a big commitment of both time and money. Completion of an online PhD is psychology program can take between four and six years, depending on a specific program's criteria. While searching for a well-suited program, students should consider the specific interests and strengths they may possess. Getting into an online doctoral program can be difficult as the admissions process can be competitive. Students should take care in preparing their application and should put special emphasis on the things that will help them stand out among other applicants. Admissions officers will usually consider a student’s GPA during the application process. If a student had poor grades during his or her bachelor’s or master’s programs, it may be more difficult to get accepted. Applicants should also be aware of any credits that may need to be transferred. Applicants should take advantage of every opportunity possible to mitigate the costs of their degree program. This includes looking for merit-based, or GPA, subsidies, federal aid and private scholarships. Individual programs may have a scholarship office or sector for which students can apply, and many professional psychological organizations give financial aid too. Prospective students should check with their adviser or admissions office for additional information. High scores on this exam may help yield merit-based scholarships as well as acceptance into a great program. Scores from this exam are typically good for five years. Test takers will often receive a social subscore and an experimental subscore in addition to the overall score of the exam. Students should ask their current supervisors, professors or community leaders for a reference. References are typically required for many doctoral psychology programs and offer an inside look into an applicant’s character, personality and work ethic. Students should also take great care in preparing a resume. Admissions officers generally want to know about an applicant’s work experience, current skill set and passion for the field. For programs that request an essay or a personal statement, students should seize the opportunity to describe who they are, why a PhD in psychology is important to them and how they plan to contribute to their community and to the field upon completion of a program. Research is often a large part of the psychology field, especially if an applicant is seeking a PhD. Students who are comfortable with research will likely have an advantage over other applicants who are not. If an applicant does not have research experience yet, he or she should consider working or volunteering for a project in the psychology field. Generally, not all accreditations are treated equally. Applicants should be sure to check their state licensing regulations as some accreditations may not be enough for a particular position. It is important to be mindful of the standards for any state a graduate may work in. The first years of an online doctoral in psychology will generally consist of courses taken in a classroom setting. During this time, students will likely be spending time absorbing foundational information and working on narrowing their focus for the elective requirements that will come up during the second and third year. Students should take great care to make connections during the first year as well as all subsequent years. Relationships with students, faculty and advisers in a specific field can lead to future opportunities. Students should consider getting involved in professional organizations and having a presence in the community. Information in the first year is typically comprised of history of the field and theory and analysis, and these ideas will often help solidify a student’s personal philosophy regarding practicing psychology. Students usually also decide on a concentration at this point. Students may consider finding a mentor who is available for questions or to act as a sounding board. Having an experienced person to discuss specific paths with can often be beneficial for a student. Students will typically be busy during the third year. Along with wrapping up elective courses and preparing for their potential desired careers, candidates may also be finalizing plans for a doctoral project and thesis. The third year is generally the time for students to explore different aspects of the field before they specialize. In addition to core courses, students may try out additional classes in areas like sport psychology, human sexuality, hypnosis or stress disorder psychology. Many programs will have a comprehensive psychology exam that is typically required of all candidates. Students should stay in contact will an adviser to learn timing of the exam and strategies to pass it. Getting licensed is not usually required to graduate, but students should be aware of the specific state licensing requirements for their future place of work. Students should consider the varying requirements of each state and plan accordingly. The final years of an online PhD in psychology program will generally not take place in a classroom or in front of a computer. Doctoral candidates in psychology will usually be out in the world in a practical setting, getting work experience and completing a doctoral project or thesis. Doctoral candidates may be required to teach a basic psychology level class to undergraduates. Candidates should use this time to master the material and exercise the information they’ve learned while teaching in a real-life setting. Requirements will often vary by PhD program, and students should put careful thought into the project choice. The dissertation will generally be an example of how the student’s research will contribute to the psychology field. Candidates should be mindful of all graduation requirements. Keeping in close contact with an adviser is recommended as things may slip through the cracks during the dissertation and final project process. Some programs require dissertation submission within seven years of admission into the program. Students will usually need to defend their final project. A candidate will likely stand in front of a panel of professors and discuss the research they did and its relevance to the field. Some students may not have updated their résumé since being admitted to an online PhD program. Once the doctorate is complete, students may have important information to add that may benefit them when applying to possible career opportunities. Some programs may still require an internship. Students can use the network they’ve established to get a fellowship or paid internship in their selected field. All U.S. states whose boards are members of the Association of State and Provincial Psychology Boards typically require the EPPP test. Be sure to check your state for specific requirements. Students typically learn how people get different personalities and how those personalities are broken down into categories. In addition, students often research how each personality is motivated and what tendencies a specific personality has when faced with common and extraordinary situations. Students usually gain a deeper understanding of how culture shapes the way people view the world. Culture can influence the ways that people deal with obstacles in life, and it can make people prone to certain hurdles. These ideas may be greatly interesting to those who want to understand how and why others think the way they do and are often explored in an online PhD in psychology program. Much of psychology is research-based, and students will likely need to learn how to track and measure qualitative and quantitative data. Students will typically learn about the psychology of people within organizations and how to evaluate their behavior and modify it in order to increase productivity and meet goals. Topics may also include culture, management of change and organizational communication. Graduates will likely have many opportunities available to them upon completion of an online PhD program. The types of opportunities may vary according to the concentration chosen, but generally, there are some exciting prospects across the board, including opportunities in sports psychology, research and collegiate-level teaching. Psychologists often study cognitive, emotional and social processes by observing and recording behavior. These professionals may work in an office or independently, and may publish research findings to further the field. Therapists generally work with patients and diagnose and treat mental disorders, disabilities and emotional problems. Some tools used may include therapies and behavior modification. Industrial-organizational psychologists often study behavior of people in their industry or in their work place. Professionals typically apply theory and principle to organizations and the people within them with the goal of motivating people to work better together. Online resources are available for PhD students in psychology that may help during their time as students and as they transition into the professional arena. Many member-based organizations offer internship and volunteer opportunities, financial aid and professional development. Some resources can help students determine insurance needs and give policy updates, and many may offer discounts for educational materials and national conferences. A member-based, grant-awarding organization, the American Psychological Association promotes the advancement of the field of psychology for the betterment of health, education and human welfare. A division of the APA, the APAGS aims to support its members through networking opportunities, web education and internship prospects. A member-based organization, APSSC is comprised of student members of the Association for Psychological Science. APSSC also puts an emphasis on improving career development of its members. The administrator of the EPPP exam, the ASPPB holds membership for many state and Canadian province boards. Check this group out for information on the exam, which students will need to take if their state board is an ASPPB member. A student organization that has chapters around the world, Psi Chi awards grants to students, holds national and international conventions and promotes the recognition of psychology among other sciences. This network is used to rank U.S. PhD programs and provides links to specific programs and schools.